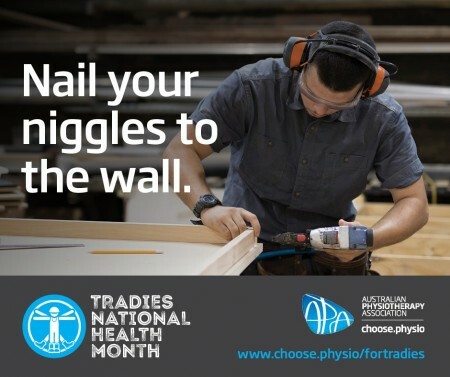 This month is about trying to prevent injuries in the workplace. It’s also about helping recovery from injury and then changing old habits that may cause the problem. 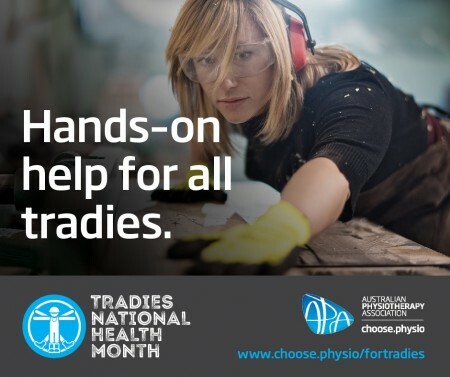 Tradies’ work involves many different skills, and the way that you lift, bend, push, pull can make a difference to your health and ability to stay in the job. Is there a more efficient way to lift? eg. Use equipment or ask another person for help. Are you keeping the weight to the minimum and not carrying it too far, too quickly, or lifting too repetitively? Are you flexing at the hips and knees, maintaining the low back in a straight position as you lift? You must not lift with your back bent, or twist while you’re lifting and you must keep the weight close to your body. It’s not only the lower back that may cause problems. Some tradies, eg. Builders or Electricians, work with their arms elevated so they can have related neck and shoulder pain. By changing habitual neck and shoulder posture, and adding frequent breaks, injury can be prevented. It is important if you have odd ‘niggles’ to get them looked at early by your Physio. Otherwise ongoing pains can result in chronic conditions. Physiotherapists can help ease your pain and then give you strategies for preventing them in the future.